This curious construction sits upon Ratcheugh Crag, about 2 miles NE of Alnwick, in full view of the East Coast railway line. Commissioned by the 1st Duke of Northumberland, designed by the great Robert Adam and built by John Bell of Durham, its exact date of erection cannot be precisely pinned down – but was probably thrown up around 1770-80. It is what can only be described as a useful folly – if that isn’t a contradiction in terms – the first floor offering spectacular views of the coast and surrounding countryside. 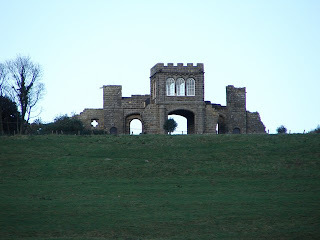 This lofty site was a favourite picnic spot for the Duke and his Duchess, though some sources suggest the building was built in memory of the latter, who died in 1776 – which would be a shame, really, as I’m sure she’d have loved it. The structure has recently undergone repair, and is occasionally opened to the public. The 2nd Duke later added a cottage for a keeper near the observatory (not in picture), to give the whole craggy prominence a rather eccentric look. Hereabouts, too, are to be found many Iron Age relics – and Ratcheugh Farm is a regular venue for the age-old pastime of point-to-point horseracing. An odd and interesting place is Ratcheugh.